ERROR 1: "Failed to get data. The data source needs to be added to the report." The OAuth token scope is incorrect. Login as the data source owner. Go to https://myaccount.google.com/permissions and remove datastudio. Click on the connecters you ever granted access to Data Studio and follow the OAuth flow to Google the right to access your data again. 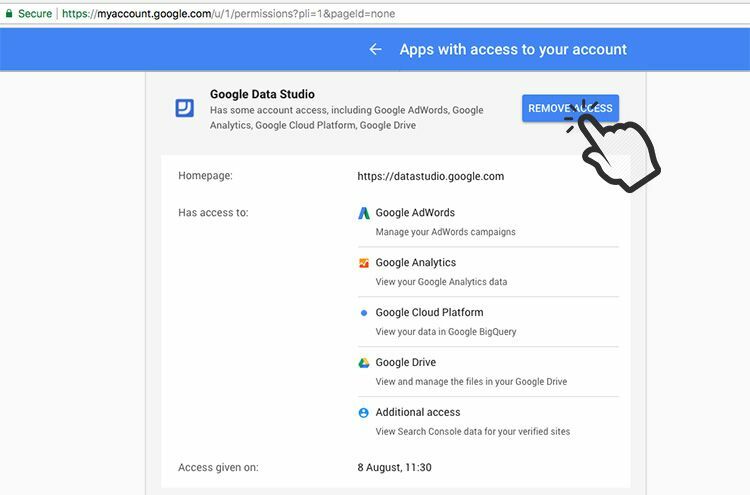 You are logged into Google Data Studio under a different email address (in a separate window), and you don't have permission to manage the data source. Data Studio uses your Google Drive to store Data Studio reports. Make sure you are logged into Data Studio with email address that has permission to access the report. You don't have the admin rights to AdWords accounts. Log into Google AdWords. On the top right corner click on the gear icon. Click on the Account Access and see if you have the admin rights. If not, ask the admin to grant you the full access to the account. Meanwhile something has changed in the data source, you can try to reconnect from the properties panel on the right side. Clik on the REMOVE to remove the unknown data source, and click on the ADD A DATA SOURCE and follow the steps to add new data source you have permission to access to. ERROR 2: "One or more of the data sources used in this report is not attached to the report." This error often appears when there is the unknown data source still connected on the report, page or chart level to your report. When on a particular page, go to Page in the main toolbar, select "current page settings", and make sure data source selected is a valid one. Hold Shift or Command and select all inserted charts that are displaying the error. Click on the 'Unknown' data source from the properties panel on the right and select the wanted data source from the list or create a new one. ERROR 3: "Configuration Incomplete: Invalid Dimension, Metric or Filter selected"
This error often appears when copying the reports or charts and then switching from one data source (connector) to another, that has different dimensions and metrics. The second most common reason is to create dimensions and metrics in Google Drive spreadsheet and use spreadsheet as data source. On the Properties panel on the right side click on the 'Invalid dimension' and/or 'Invalid metric' and select the correct ones on the drop-down menu. Google Drive spreadsheet as data source. Make sure that all dimensions and metrics in spreadsheet are located in the first row, and that each of them are in separate columns. Go to Google Drive and select spreadsheet as data source, or reconnect the spreadsheet once again, accepting the changes in data source. There could be various non-related reasons for this type of error to occur. This error often occurs when someone has restricted sharing, downloading, and copying of the files for reports or data sources. You can make someone else the owner of the report or data source, and vice versa. Click on 'Share' report feature on the top right corner and go in 'Advanced' and transfer ownership. You can edit the Report and "add an additional Datasource" connected to that account, and select all charts to use this new data source. Google Data Studio sometimes cannot recognize date columns from any Big Query data sources. Big Queryuses YYYY-MM-DD format but Data Studio uses YYYYMMDD. Since Data Studio is still in Beta, product upgrades may cause system errors and performance issues. For example, Google Analytics have renamed the 'Unique Events' metric to 'Unique Dimension Combinations'. Also, they've deprecated the API field and also created a new metric called 'Unique Events' which is calculated differently to the previous Unique Events metric. Refresh Your Data Source: In edit mode, click on the widget showing the system error and click on the pencil icon next to your data source and 'Refresh Fields'. Click on 'Invalid Metric' and select metric you want to use. If you are pulling data from API or spreadsheets, double check if data presented in Google Data Studio is correct. Try to reload your report a few times in a view mode to make sure you are always getting correct data. If you are adding custom metrics make sure that numbers of other metrics are correct as well. When using Google Data Studio, you may experience some minor (rarely major) bugs that might break certain portions of your reports, but almost all of them are easy to fix in only few minutes. Google Data Studio is still going through changes, so we can expect frequent patches and updates. Despites minor bugs, Google Data Studio is a great tool to track KPIs that support business objectives and generate periodic reports.